LA Unified has returned the last of the military-style weapons it received under a controversial federal program. The news was released in a letter Tuesday, which stated that as of Feb. 5 the last of the weapons, demilitarized rifles, were back in federal custody. The letter from LA Unified Police Chief Steven Zipperman was addressed to Eric Mann, president of Fight for the Soul of the Cities. 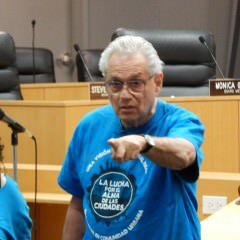 Mann and 10 other demonstrators from the group temporarily shut down an LA Unified committee meeting Tuesday afternoon demanding that the district account for any military-style weapons on school campuses. When Committee of the Whole president George McKenna opened the meeting shortly after 2 p.m., Mann and the others, dressed in blue shirts, stood at the podium to address the school board members on the committee and Superintendent Michelle King, who was also at the meeting. McKenna asked everyone to stand for the Pledge of Allegiance, and Mann tried to interrupt it. 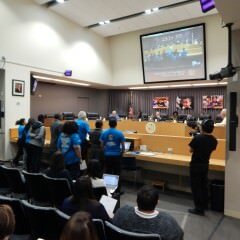 There is a speaker card system at LA Unified meetings where anyone is allowed three minutes to discuss any topic or agenda item, but the group refused to follow the procedures. McKenna asked the group to be seated and said he had met with them previously, but the protesters kept shouting and chanting. After three warnings, McKenna said he was suspending the meeting. When the meeting was closed and the committee members walked out, the protesters stood at the front of the LAUSD board room and spoke about their demands to end the federal government’s 1033 Program, which assigned weapons to school districts. “We want them to meet our demands and we want reparations and totally dismantle 1033,” shouted Barbara Lott-Holland, one of the protesters. The other demands include a full history and accounting of the weapons that the police officers still have, what was returned and severing ties with the program. They want a pubic apology and reparations, including a 50 percent cut in the police force, and want President Obama to terminate the entire 1033 program. “We got rid of the program,” McKenna said to the protesters as he was walking out. The LA school police — the largest school police force in the nation and fifth-largest police force in California — possessed three grenade launchers, a mine-resistant vehicle and dozens of M-16s. In response to criticism, LA Unified got rid of the grenade launchers and vehicle it had obtained through the program but kept the assault rifles. The federal government also severely restricted the program. Zipperman’s letter on the 1033 program stated that LA Unified had ended its involvement in the federal program and last summer stopped procurement of weapons from the program. Zipperman stated that he could not put on display or destroy the weapons as they were now in federal custody. During the demonstration in the board room, it was emptied out except for a handful of people as the demonstrators spoke. The live TV feed was cut off, and administrator Earl Perkins did a five-minute countdown to clear the room. 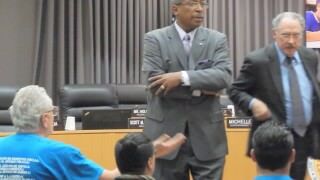 Six LAUSD police officers lined the room and allowed the protesters to talk for about half an hour. Eric Mann shouts to Earl Perkins as George McKenna walks out. The group disrupted the full school board meeting for about 20 minutes in July, and afterward board members went to talk to the activists. After holding the room and speaking, the protesters marched out and held demonstrations outside the headquarters at 333 S. Beaudry. They plan further demonstrations and an art exhibit after the meeting later in the afternoon. “I want to thank the police department here and Earl Perkins for keeping the decorum of the room during whatever that was,” McKenna said when he returned and re-started the meeting.